Needles and Hooks and Books, Oh My! : WIP Wednesday Again! I feel like several WIP Wednesdays passed without me noticing them. Being busy with student teaching and musical rehearsals and work and wedding planning has left little time for blogging and crafting. But I am still managing to work on a few things here and there. I have so many pictures to share, but for today, I'll keep it to one. I'm reading the World History textbook in preparation for my next round of lessons-- Kingdoms of Africa. Hopefully the students will take to it, as it is not my best area of knowledge. There are 2 different hats in progress, both commissioned items. The black is the start of another Toothless hat, and the pink is a new design. To the far right is my finished Citron, which I will share on Friday. The green smack dab in the middle is my second Snowdrop, in Knit Picks Chroma. I've finished my first audiobook of Lent-- CS Lewis' The Lion, the Witch, and the Wardrobe. Definitely one of my favorite books to read, and easy listening, especially when knitting or crocheting. Linking with Ginny and Tami today! Lots of lovely projects on the go, looking forward to seeing the Citron on Friday. Oooh Citron ... I recently made one of those! That green will make a lovely Snowdrop, too. I like that knitpicks yarn! Nice colors. So many projects! Good luck with them. I really like that green colorway! Narnina is one of my favorite worlds. 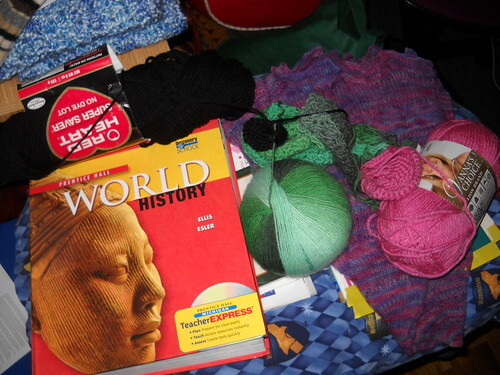 love the yarn - I have the same book on my iPod: am about 1/2 done... it is quite nice for knitting/crocheting. What's next on your play list? I am looking for something after this one.